For the most part, you can buy thousands of emails on another person's contact list and still generate very poor sales. The secret to creating a good list is to build one up naturally and organically so that people have a good relationship with you and your business. You may put out an opt-in list and be congratulating yourself on the number of sign-ups, that is, until you find out many are fakes or generated by online bots. Learn how to use a double opt-in strategy to build a better list. There are plenty of products and services to help streamline your online business. There's no reason why you should be struggling with responding to each and every email, unless there is some reason for personally responding. Learning about the technologies and tools available can save you valuable time and increase your bottom line. It's up to you to figure out what that price is. It may be that they are willing to subscribe if you give them a free short report. It might be that they will do it to enter a contest. It might be that they will reply to an email when they see a savings in a product they like or when they get your personal attention. Pay attention and do what works for you. Facebook has a very crisp, business-like interface that helps you to maintain a more professional image for your profile. Join groups, network with likeminded people, or even advertise within Facebook. It's a great way to find demographics very quickly. For people who don't have enough time to put up a full profile, just hop onto Twitter. Using 140 characters in each update, you can build up a quick following without too much time involved. This is more of a business directory, but also a great place to network. Demographics are typically segregated into a few marketing categories: gender, age, income bracket, ethnicity, and education level. Of course, you can set up any number of demographic variables to help you market to your niche, but these are pretty standard. Just knowing several of these demographics about who is visiting your site can substantially help you to increase the responsiveness of your list. How? The trick is to send emails that talk personally to a specific group's needs and provides that demographic with solutions to the problems that they see day to day. The one with college-aged students gets emails on how laptops can help them to complete assignments in between class or to take their studies with them anywhere. The email that goes to business people may target people who are in their cars (like real estate agents) or who spend a lot of time travelling for business. In that case, the biggest benefit is that it will increase their work productivity as they get the essentials of their business travel done. Once you start to figure out why people are buying, you can start to separate people into different mailing lists, according to their demographics. You can set up one list for 18- to 25-year olds and another for those over 30. Next time you want to send out a promotion for a particular product or service, you will have a good idea what psychological triggers work best with either list. Once you start building mailing lists for marketing purposes, you will find that there are tools and services out there to help simplify the process. 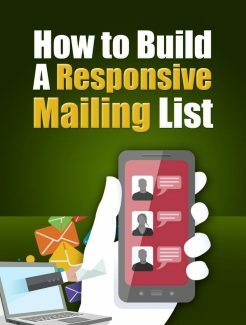 There's no reason why you have to learn how to build a responsive mailing list from scratch when you can use the tools and services provided by others. Just make sure that they are simplifying your life and not complicating it. Here are some tools or services that can help you do just that, while encouraging your subscribers to be more responsive.